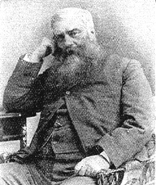 George Alfred Henty (1832-1902) writer of historical adventure stories for boys. Henty was born December 8th 1832 in Trumpington near to Cambridge the eldest son of a wealthy stock broker. From sickly beginnings to life he went on to attend Gonville and Caius College Cambridge. With the outbreak of the Crimean War in 1854 he left Cambridge without completing his degree. Along with his younger brother they volunteered to join the British Army. They were both enrolled into the Commissariat Department, this non combatant department provided logistical support to the troops and both Hentys found themselves assisting in the supply of food at a field hospital in the Crimea. The conditions they witnessed, that the fighting men endured were truly appalling, vivid descriptions of which he wrote of in letters home to his father. Disease besides death in battle was also a great killer with over 8,000 reported cases of Cholera and Malaria. Unfortunately the younger Henty succumbed to Cholera and died in 1856. Henty continued to write home to his father who was so impressed with the letters that he arranged for them to be published in the Morning Advertiser. Henty himself would eventually fall ill and be forced to return home where his military career would continue both home and abroad until after attaining the rank of captain. Tiring of the military, he resigned his commission in 1859. He would go on to draw heavily on this period of his life in the description of war in his later books. Upon returning home Henty became involved in the management of a number of family owned business however, not finding the work to his liking, in 1865 he made the decision to become a writer. Initially working as a journalist for The Standard he would later become their "war correspondent" and travel widely reporting on conflicts around the globe. When not reporting on wars Henty took to writing books for boys. These were very much in the "Boys Own" style involving events and battles from the past. His own experiences enabling him to add a degree of realism to fiction often missing from his counterparts works. He went on to publish 122 historical adventure books, many involving military events from the past. 'Through The Fray A Tale Of The Luddite Riots' was published in 1886 and although at a tangent from his normal subjects provides an enjoyable fictionalised account of the events that still remains very readable today. You can read the book below. To do so you must have a Suitable PDF Reader installed on your computer.